Julie Seedorf is a Minnesotan. She calls dinner, supper, and lunch, dinner. She has had many careers over her life time but her favorite career was that as mother to her children. In later life she became a computer technician, opening her own business. 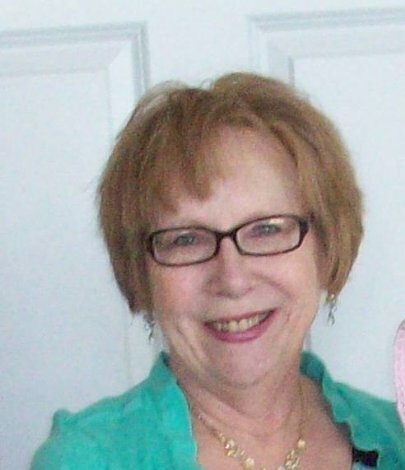 Julie writes a column for southern Minnesota area newspapers called “Something About Nothing. 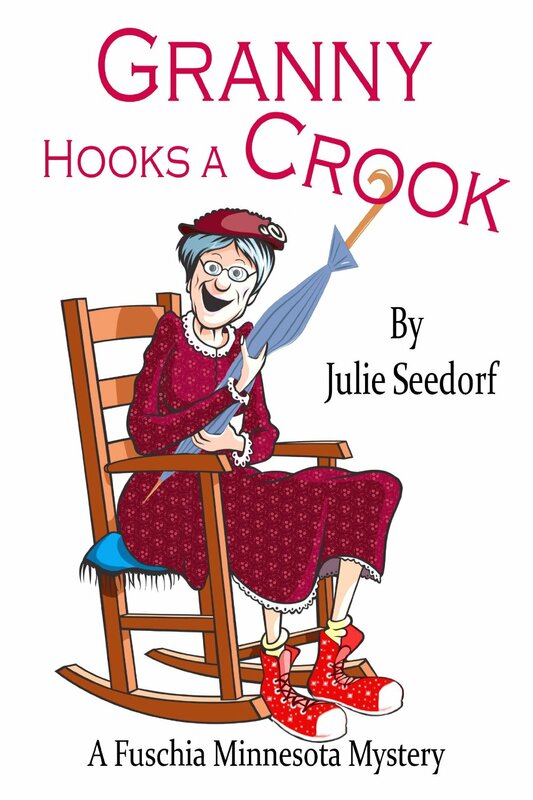 “Granny Hooks A Crook” and other writings such as “Whatchamacallit, Thingamajig” follow her theory that we all take ourselves too seriously and we need to have a little fun. She secretly yearns to be like the Granny characters in her books. I am trilled to have Julie here today, welcome Julie. How much of Granny is really Julie and how much is your mother (as I read somewhere)? I think a little of the zany part of Granny is me, her ideas and her love of colors, junk food and a few more wacky things. As parents we occasionally forget the part of ourselves that still lives in us. We forget the part that is our creativity and our love to play because we are so busy working. I had forgotten a part of myself in all the responsibility of life. Watching my grandchildrens’ love of life, I found myself again. Granny is somewhat like my mother in that my mom was stubborn, thought she could do anything and yes, when she couldn’t drive anymore and her car was taken away, she tried to rent one. Luckily I happened to be at the car dealership when this happened. I always had to be one step ahead of her. There were many times when she was in her 90’s that I got called by neighbors because she was on her roof fixing it. You bring zany to a new level in this book. Was it a conscious decision or are you just that zany yourself? It is possible that I have this zaniness inside of me wanting to come out. You would have to ask my friends if I am zany. I have always had crazy ideas. I see things differently whether it comes to decorating, activities for churches and communities and other things. I don’t necessarily have a normally decorated house. It certainly could not be called tasteful but some of the rooms are fun. Zany wasn’t a conscious decision with the book. I feel it was a God decision. We have so much gloom and doom in the world and I was at a point in my life where I had been Ill and went into a depression. I had quit doing the things I loved, to do the things others thought I should be doing. I started writing and Granny and Fuchsia, Minnesota just came out. Every morning I would wake up with the new chapter in my head and the craziness kept coming while I was writing. This book is not for everyone. For example one of the critiques was from a woman who was taking care of her elderly father with Alzheimer’s and she felt the memory loss was no laughing matter, and had I experienced that I wouldn’t be writing about memory loss the way I had. In reality, my mother, my mother-in-law and my sister-in-law all had Alzheimer’s. I did have to deal with it and the only way I found to be able to cope was humor. Once I did that it made it easier and it also gave me good times and good years with the time they had left and it gave me more patience. I said in my review that it was sort of like reading a children’s book or more accurately felt like one was being read to me. Which was a very comforting feeling by the way. Once gain was that a conscious decision or does it just come naturally from so much reading to children or grandchildren? I didn’t make a conscious decision to make it that way. It just happened. Again I remind my readers that his book isn’t for everyone, it is for those who want a little fantasy away from the real world. Some of the criticism is that my character isn’t believable and neither is the community of Fuchsia. It isn’t supposed to be believable. I wanted a fluffy book to take us away from the unfluffy world. I wanted a character that could have fun, make fun of herself and also live in a community without so many stringent rules. This community takes life a little easier and doesn’t stress out on having the perfect community. The residents of Fuchsia enjoy the community. The houses aren’t all the same color, the main street is unique in the fact that merchants have to keep the buildings in character with what they sell and not become clone Main Street America. The people of Fuchsia, think for themselves, embrace their differences and accept them and watch out for each other. Yet, they have problems but deal with the ups and downs in their lives with humor. I also believe there are characters in the real world like Granny but they are forced to hide their real selves in order to be accepted in society today. Was it tough to find a publisher willing to accept something so different? Again, I call it a God thing. I sent it in to Cozy Cat Press on a whim. I was reading a Cozy Cat Press book one day and thought that was where my book might possibly belong. It felt right in my heart. I queried them and they answered me rather quickly and had me send in the manuscript. I received an answer back rather quickly explaining that it was too short and they were torn about publishing it. If I made a few changes and made it longer, they possibly would publish it. I did that and the rest is history. It all moved rather quickly but I must say that for some reason it felt right and I did not have a lot of anxiety about it as I was rewriting. The other interesting thing that happened during this process was the book cover. I didn’t tell anyone how I saw Granny in my mind. When the cover came back I realized that was the way I had pictured Granny. A few weeks later as I was wearing the Granny T-Shirt that I designed I started strongly remembering my Grandmother that died when I was six years old. I realized the Granny on the cover and on my t-shirt and mugs that I have for sale in my Hermiony shop is the spitting image of Granny right down to her knobby nose and her stick body along with her hair and the way she wears her hair. No one could have known that. I didn’t even know that and I had to dig out an old picture to prove it. Yes a God thing. When will be seeing Granny’s next escapade? And do you have a title yet, maybe a little blurb you can share that doesn’t give too much away? Granny sat down and flipped open her laptop computer and headed straight to etellme.com. “Ooh, this is going to get messy,” Granny thought. First she was supposed to cover his fur with a large layer of liquid dish detergent, then dampen a soft cloth with water, then wipe off the dish detergent with the soft, wet cloth and keep repeating the steps until the greasiness was gone. Granny thought maybe she picked the wrong item to use to squeak Baskerville through the door. How in the world was she going to get him to sit long enough to do all that? She needed to think, but fast. Granny dug in her refrigerator and brought out the big steak that her kids had left her last time they had visited. She led Baskerville to her Jacuzzi tub in the bathroom because it also had one of those doohickey nozzles that moved. She coaxed Baskerville into the tub with the steak and put the steak by the farthest wall of the tub. As Baskerville was nibbling on the steak Granny doused him with dish detergent and started rubbing his fur with the soft wet cloth. She had started to rinse him off with the doohickey nozzle when a loud pounding on the door began. Baskerville jumped at the same time as Granny jumped, making them collide in midair. Granny toppled in the tub on top of Baskerville and the doohickey nozzle Granny had been holding slipped out of Granny’s hands and became uncontrollable, spraying them and the bathroom. It was a snake striking anyone that got in its way. Just at that moment the door opened. Granny looked up to see three mouths wide open in shock and three sets of eyes that mimicked an owl trying to see at night. Her kids were here. If you could invite any writer, living or dead, over for a cup of tea and a chat, who would it be? And why? This may seem like a strange answer but I would invite Barbara Johnson, a Christian Writer known as The Geranium Lady. Her books were hilarious. She is someone that lost a lot in her life and went through some terrible turmoil and struggles. She died a few years ago with brain cancer. I would ask her how she kept her faith in God with what she went through and also how she kept her sense of humor. I learned so much from her. What is the best book you’ve read recently? Why? Recently I would have to say “Blood Sisters” by Melody Carlson. I didn’t expect to like it and I almost didn’t read it. I started it and it drew me in and I couldn’t put it down. The loyalty the main character felt for her childhood friend really resonated with me because I have that kind of friendship in my life. This book also touches on moral issues that many of us shove to the side because we don’t have to face them in our own lives. It is not the type of book I usually read but I am glad I took the time to lose myself in this book. What is your favorite food? Stuffing and donuts. Thank you so much for being here today Julie, good luck with GRANNY HOOKS A CROOK. Before you go, is there anything else you would like to tell your readers or have them know about you? I have two cats Boris and Nathasha. They are exactly like the shysters in my book. I didn’t have them when I wrote the book, they somehow adopted me in between the writing and the publishing of my book. I somehow feel that someone up above has a sense of humor, perhaps my Grandma, by making my fictional characters come alive in Boris and Natasha. And I have been reading Julie’s column in the Albert Lea Tribune. You should check it out. What a terrific blog post and review. I just added this book to my GoodReads want to read list. What a wonderful interview–makes me want to read this amazing book about Granny!